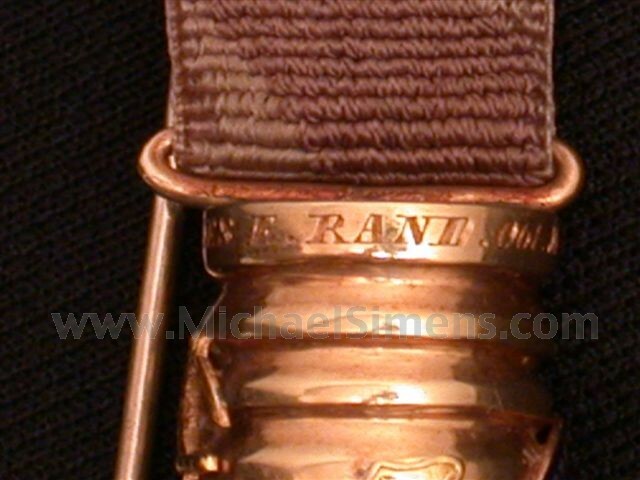 Civil War badges of all types are one of the most popular artifacts in the entire realm of Civil War Collectibles. This one is at the top of the food-chain and I doubt we'll see its like again on the open market. It is simply outstanding, the best I have ever seen. 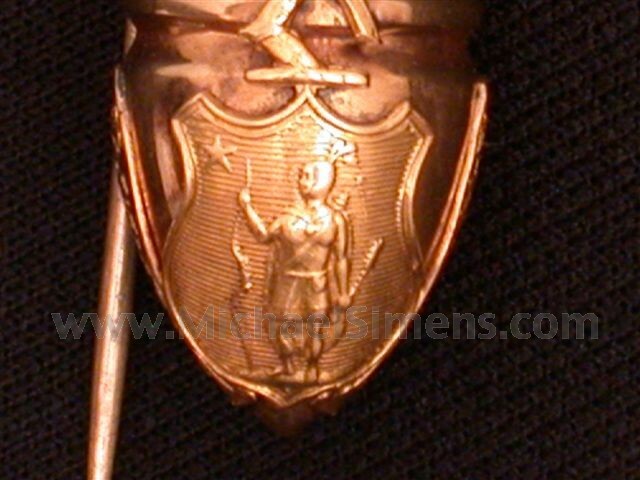 Roughly 3 & 1/2" in length, it's topped with a shield with engraved unit I.D. of " 1st Regt. Mass. Vols.". Attached to its back is a drop of red, white and blue cotton weave that is very faded. 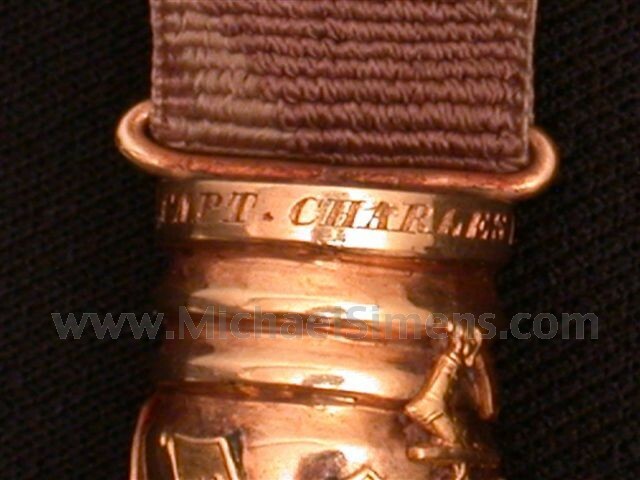 Across this ribbon is a ladder step that is inscribed, "Chancellorsville". At the end of the drop is a minnie-ball that has the State Seal of Massachusetts and on the reverse is inscribed in gold over blue enamel, 7 battle honors. 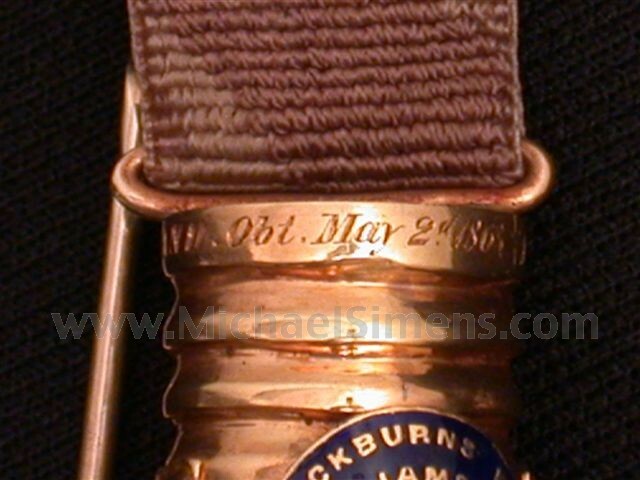 The condition is so perfect, one need only look at the photos to clearly see the minty gold gilt honors of the Regiment's illustrious history from Blackburn's Ford through the Battle of Fredericksburg. On the rim of the minnie-ball is inscribed "Obit, Capt. Charles E, Rand, May 2, 1863". The First Massachusetts was one of the fightingest Units of the Civil War, going on to see heavy action at Gettysburg, Wilderness and Spotsylvania, suffering hundreds of killed, wounded, missing and captured during their service. Rand was a 28-year old landlord when he mustered into Company "I" and served as it's Captain until killed at Chancellorsville. I have heard complaining for the past 5 years that nothing good is ever offered for sale any more. Well, this might be pricey, but it's about impossible to improve upon in terms of its history and importance. If you want the absolute very best, here you go.